There's been much debate in the blogging world for p2p lending about how to calculate returns on our loan portfolios. Some very prominent people in our industry, including Peter Renton of Lend Academy, believe that the most accurate way to calculate returns is through Internal Rate of Return or IRR and/or its modified cousin XIRR. IRR is a common way to calculate returns when payments are fixed like in our loans on the p2p platforms where the borrower is paying X per month over 36 or 60 months. Peter has a great site that you should check out, btw. However, I still believe that ROI (Return on Investment), is the best indicator of how our portfolio of loans is doing, provided we calculate ROI correctly. Most think it is the return (interest) over the amount invested. That would be true only in the first month. Continuing to take the amount invested as part of our equation would actually make this calculation closer to Return on Invested Capital (ROIC) and it would also be incorrect for us since our investments are loans. IRR assumes some things like we can reinvest our interest earned at the same return as the current loans in our portfolio. 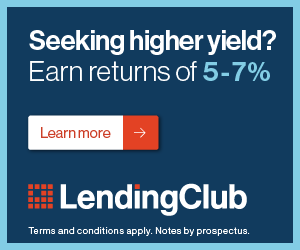 This could be a problem as generally speaking in the macro economy, interest rates are starting to rise, yet on the lending platforms especially Lending Club, rates have dropped a little bit. The rate at which we can reinvest some of the proceeds from our loans is very unpredictable. This predictability is even more in doubt due to the huge chunks of institutional money coming into these platforms also to invest. There are some other assumptions made about IRR too. CFO.com, a site and magazine for Chief Financial Officers, has a Kinsey study on its site that outlines some of the issues the most important of which is that 'IRR is a true indication of a project's annual return only when the project generates no interim cash flows' and 'when the calculated IRR is higher than the true reinvestment rate of the cash flows than the measure (IRR) will overestimate, sometimes very significantly, the annual equivalent return of the project' (Kinsey & Co, 2004). XIRR does handle the fact that we get some cash flows in the interim with our loan payments but it does not handle well the fact that almost all of us choose to reinvest our interest into additional loans. IRR's fundamental problems affect XIRR as well except for the cash flow issue above and that XIRR accounts for the non-periodicness of the loans, that is payments coming in at different times. One of the benefits of my ' no need to put $25 into a ton of loans' strategy is that there are fewer loans to track. However, even if you have 1000 loans, both Prosper and Lending Club give us some tools to help us calculate our ROI correctly. Lending Club calls it Outstanding Principal and Prosper calls it Principal Balance. Prosper is kind enough to add up our total Principal Balance remaining while LC does not and we have to do it for ourselves. Both are located on our monthly loan statements, which I hope you are looking at every month when they are ready. This loan started as $250 so if I kept using $250 as my denominator instead of principal balance, that would give me an inaccurate and declining ROI each month. Even if you find the math intimidating, you know that you are getting some principal back and some interest every month. Your statements show it. This table is just for illustrative purposes as I did not subtract out the $0.20 Prosper charges as its servicing fee for servicing the loan for us which would bring the actual ROI number for the loan down a little bit. Since my principal has declined from $250 down to $235.38 in August, the interest that I am earning in dollars will also decline although the ROI will be more consistent since both our numerator and denominator are declining. It involves a little more work with Lending Club as you have to add all of your Outstanding Principal balance numbers together against the total collected interest, but the result will be the same, a true ROI for your entire loan portfolio. I use this so I can see which loans are the most profitable in my portfolio to add that to my existing research so I use it both for my whole portfolio as well as for each loan individually to evaluate its performance. While XIRR is a pretty decent assessing tool for the success of the loans we choose to invest in, a properly calculated ROI where we take into account the fact that some of our principal is paid off each month is a more accurate tool for the overall loan portfolio at large. What do you think? Please comment below or email me directly at Stu AT p2plendingexpert.com as I'd love to hear your views. Great article. I think you provide a completely valid approach for calculating return that has its pluses and minuses. On the plus side as you rightfully point out this is a very accurate way to measure ROI on outstanding principal. The weakness of this approach is that it doesn’t take into consideration the cash drag on your account. If you let your cash build up your ROI using this method will overstate the actual return for your entire account. That is one of the reasons I like IRR so much. But I also acknowledge there is no cut and dried solution or industry standard yet. I think ROI actually hits the cash drag on an account harder as the way I have been calculating that is as Zero interest earned, thus driving down my total portfolio return. Ok. So, how do you account for cash exactly in your calculations? It was not part of your equation. If the cash is deployed but waiting like for a LC loan that is “In Funding” but not Issued then I count it as money invested with zero interest earned. It’s why a couple months of my returns are around 1.2% or 1.3% instead of being higher like the stated interest rate. As an aside, cash deployed but doing nothing has been an especially big problem at LC. It took me 22 loans to get the 10 I wanted. Imagine a single loan. Principal Balance remaining (the denominator in your expression) tends to zero over time, so your ROI skyrockets the closer to maturity you get. You cannot use this as a measure of return on investment, sorry. Actually the reason why you can is that the amount attributed to Interest each month also declines just like how principal balance also declines since the loan is fully amortizing. how do you account for your returns? Just curious…. 1. Do you consider the number of days early or late that a payment is made within a month. For instance, if a payment is made on the 15th but was due on the first do you consider that the return is actually less than if they had paid on time? If so, how do you account for it? 2. Do you use the principal balance due on the loan at the previous end of month? 1) I consider a late payment a non-payment for that month since I am calculating Interest Received and it’s not received on the day I calculate it if it’s late. 2) I do use the principal balance at the end of the previous month unless I calculate it at month end and then I use the current month.